In early January, we received notice from our printer that they are “winding down” their printing operations. Furthermore, the January issue would be the last they would be able to produce for us. We were blind-sided by this news as zero notice was provided to find an alternative. As you know, we have had great difficulty in recent months getting the Granger into your hands by the beginning of each month. Delays by the printer and even greater delays by the US Postal Service have compounded the problem. So ending our relationship with this particular printer is not as painful as it otherwise might be. Until now, the Connecticut Granger has been printed on what is known as a web press used by newspapers worldwide. Unfortunately, the newspaper industry is shrinking and fighting to stay alive with the proliferation of online news sources and related content available in so many different forms outside of the printed newspaper. The shrinking readership of weekly and daily newspapers has caused large numbers of publications to print off-site rather than in-house. In fact, most of the newspapers (other than the largest dailies) have closed their print shops. In Southern New England there are a precious few web printers left who will even consider printing short-run newspapers. They are located in the Springfield, MA area and Fairfield County, CT (not ideal for us). With few options the decision was made to go in a different direction. Instead of sub-contracting out the printing to a far flung print company we have opted to have PrintMaster in Torrington print the Granger. This will allow much greater flexibility as they are able to print each issue with a two day turn-around. 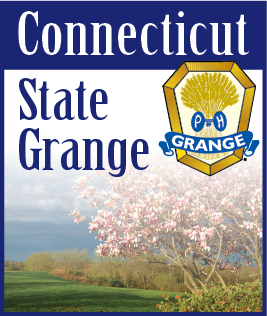 You are familiar with their products as they have been the “official” printer of the State Grange for nearly 30 years printing everything from Blue Books, State Directories, brochures, and more. While it is sad to see the Granger move away from newsprint and the tabloid format that has served us so well, we are returning to the original format of the Connecticut Granger. It remained in this format for many years until it was determined to be too costly (at the time). Printing in the tabloid format (at the time) was much more cost effective and the Granger evolved into the paper we have known for decades. We know it will take a while for our readers to get used to the new format and style of the Granger. We will make every attempt to keep it familiar and to provide as much content as we have in the past. Please let us know how we are doing. Contact information is provided on the back page of February issue. You can also email us at: Granger@CTStateGrange.org. The old saying holds true - - “Everything old is new again”!